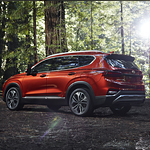 The Hyundai Santa Fe is a big and bold full-size SUV. While this vehicle has plenty in the size department, it still handles like a smaller vehicle. This handling prowess is due to many factors that include specialized suspension components, steering assistance, and a dynamic motor. The Hyundai SUV offers the comforts of specialized shock absorbers and springs. In the front, it provides gas pressurized shock absorbers mated with MacPherson strut coil springs. In the rear, MultiLink shock absorbers and stabilizer bars combine to provide extraordinary support. The Hyundai Santa Fe also offers drivers the specialized Motor Driven Power Steering (MDPS) system. This mates old fashioned rack and pinion technology with power assisted components to make directing the vehicle as easy as ever. In addition to these power steering components the Santa Fe includes a more than capable dual overhead cam motor putting out a minimum of 185hp. This level of power comes in handy for group outings or for towing heavier loads.